Cupping is one of the oldest methods of alternative medicine. This therapy uses cups to create local suction on the patient’s skin. The suction created by cupping pulls stagnant fluids to the surface, removes toxic pathogens and promotes fresh oxygenated, nutrient rich blood & lymph. The cups are usually made of glass or silicone. There are types of cupping methods: dry cupping and wet cupping. While dry cupping therapy uses fire or a pump to create the vacuum in the cups. Wet cupping still uses the vacuum but also involves movement of the cups across the skin. At TCM Shanghai, the patient goes through a TCM Health Screening and a doctor’s consultation prior to the cupping treatment. Based on the findings, the doctor determines the type of cupping needed. He will then identify the areas of the body to place the cups and the duration of the therapy. The patient will be asked to lie down on his/her back or front depending on where the cups will be used. The therapist then places the cups upside down on targeted parts of the body using a flaming stick or a pump to create a suction and vacuum. The cups stay in place for a period of 5 to 15 minutes. The number of sessions required depends on the patient’s health condition. TCM Shanghai has special cupping therapy package for health regulation and can also be used effectively for weight loss and slimming. What can the results be and how do you feel? Most patients experience a relaxing sensation coupled with relief when cupping therapy is performed. They might also experience a slight twinge when the skin is pulled up by suction. After the cup is removed, patients might notice a circular bruise or marking. However, these bruises are not painful, it is only signs of the cups doing their job. The color and pattern of the marks depend on the level of stagnation in the area. They can range from a bright red to dark purple. They cupping marks usually lasting 3 days to a week, sometimes longer if the person is very sick or leads a sedentary lifestyle. These marks usually decrease over the therapy sessions indicating a successful treatment. If there is no stagnation present, there will be only a pink marking which disappears in a few minutes to a couple of hours. 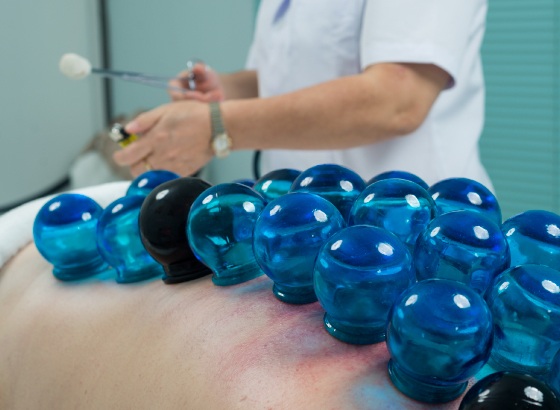 Cupping enhances local circulation of qi and blood in the treated area, alleviating swelling, pain, and tension. If you would like to see how cupping can help you relieve pain or stress please contact us below or call us +971 4 886 2862 and make an appointment. Cupping therapy is a great therapy for local pain relief and muscle relaxation. It is especially effective for sports related injuries and recovery. It can improve overall health by treating energetic blockages, removing stagnation and enhancing the circulation of blood and Qi in the targeted body areas. Furthermore, wet cupping, similar as Hijama, is believed to clear the shallow and deep muscle tissues from toxins while boosting the immune system.